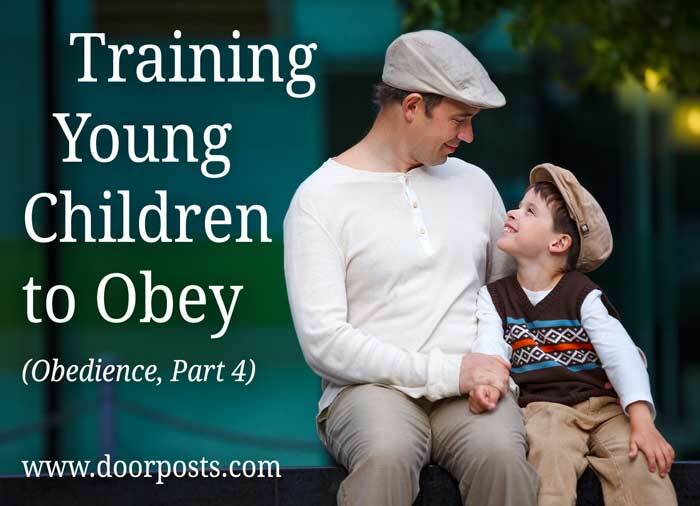 Last week we considered what obedience looks like, and how our own example is an integral part of teaching our children. Our goal in teaching obedience now is to give our children the self-control and the maturity they will need to take responsibility for their own lives as young adults, when they’re out from under our authority and directly accountable to God. Though we exert tight control in many areas now, we must aim to progressively lift this control and give our children more and more freedom as they grow. Our authority and control will decrease, and their personal responsibility will increase. Parents of adult children tell me it’s a rewarding process to make this transition from being the authority over your child to becoming his trusted counselor. We can’t and shouldn’t expect our children to obey us for the rest of their lives. This is a short season. We don’t want to spend all day in discipline mode. If you have little children, you’re already working pretty hard just to keep them fed, clothed, rested, and occupied throughout the day. Establishing household routines helps reduce potential conflict points. When everyone knows that we get dressed for bed, get a drink of water, then read a story on the couch, and then go to bed, the children will know what to expect, and you won’t have to give (or enforce) so many commands. This tactic made a huge difference in our home. Incidents of disobedience decreased as we settled into routines for cleaning up after meals, taking afternoon naps, and getting ready for bed. Children thrive on this kind of structure. Have you ever noticed that the situations you most want your children to obey often occur at a time or place that it’s hardest to discipline them effectively? They act up during the church service, when we don’t want to make a scene, or at bedtime, when we’re getting tired and easily frustrated. At times like these, it’s harder to keep our cool and to know what to do. Sometimes it helps to set up a training opportunity at a time that’s more conducive to teaching. Children can learn to sit still while you read stories at home before you expect them to sit still in church. They can learn to stay in their beds for a short naptime during the day, and then bedtime will be easier. Reminding them of your expectations before going into church or into the store can be helpful too. Our children learned to respond with “yes Daddy” and “yes Mommy” when we made a silly game out of it and played that game with them for a few evenings. They loved it, and it helped them get into the habit. Having them respond when we talk to them helps us know they heard us, and it seems to help them obey more cheerfully and promptly too. 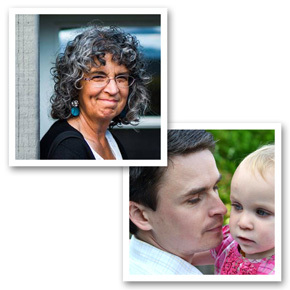 After reading Reb Bradley’s book Child Training Tips, we realized that giving our young children too many choices throughout the day was making it harder for them to submit their will to ours. If preschoolers are allowed to be self-centered all day, choosing the clothes they will wear, the food they will eat, the stories we’ll read them, and the activities we do with them, it’s not too surprising that they don’t want to stay in their beds at bedtime. Our children seemed to get frustrated and even overwhelmed when we gave them too many choices (which I was doing mostly out of laziness). We had to take back almost all of these decisions until our children became at peace with us being in charge. Rebellion is the heart issue. When it comes time to discipline for disobedience, we need to distinguish between rebellion, which is a rejection of our authority (and ultimately God’s), and immaturity, which would include things like accidentally spilling their water or other non-moral issues. Children who make mistakes might need gentle instruction, but not chastisement. Help them see their heart. When our children disobey, we shouldn’t despair. We should be glad for the opportunity to do the real job God has given us. 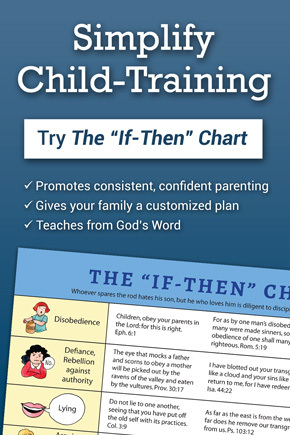 God didn’t say “make sure your children obey cheerfully the first time.” He told us to discipline our children and to raise them up “in the nurture and admonition of the Lord.” Our children are sinners (just like us), and their outward behavior reveals what’s going on inside their hearts. Training methods like bribery, punishment, and various kinds of manipulation can produce well-behaved children. But that completely misses the point of Christian parenting. A disobedient child needs to see his sinful heart and the grace, hope, and strength to change that only Jesus offers.This is where we can bring God’s Word into the process, both in pointing our children to God’s standards and then to what Jesus has done for us. Even by age 3 or 4, young children can begin to grasp this. In the Bible, disobedience and rebellion usually bring God’s children painful consequences. Hebrews 12:6 says “For the Lord disciplines the one he loves, and chastises every son whom he receives,” and Hebrews 12:11 tells us “For the moment all discipline seems painful rather than pleasant, but later it yields the peaceful fruit of righteousness to those who have been trained by it.” God has ordained “the rod” as the means of chastising disobedient children and keeping them in the “safe zone” of submission to proper authority. Coupled with love and verbal instruction, the rod can help reach a young child’s heart. For these reasons, controlled spanking is an appropriate part of our parenting toolbox. It is possible to misuse the rod, and so we must be careful not to spank when we’re angry, frustrated, or out of control. We must not spank arbitrarily in an unpredictable way. Spanking must be done carefully, out of faith in God’s instructions, as His agents for the good of our children. Discipline is corrective, not punitive. There is a difference between discipline and punishment. The goal of punishment is justice and retribution for a sin or crime. The goal of discipline is repentance, growth, and life. Discipline is designed to bring about change in the person being disciplined. Discipline is concerned with the person’s future and well-being. I said earlier that this is a short season. But it doesn’t feel like it now. It takes time. Disciplining for the same thing ten times in one day does not mean you are a failure. It might just mean you’re doing your job. Faithful discipline should help our children grow in obedience, but we won’t ever have perfectly-behaved children who never sin. Still, we can trust that God is working through us. God calls us to love, discipline, pray, and trust Him with the results, because only He can change hearts. Note: Some of the suggestions in this post may not apply in the cases of adopted, foster care, or special needs children. In some situations, physical chastisement is prohibited, and at other times it’s counterproductive if the child has a history of being abused. Another great post! Thank you for all the useful suggestions! we are so thankful for your ministry and this series of articles! my husband and i didn’t grow up in Christian homes, and need much training ourselves to know how to train our 6 year old son, whom we love dearly. may i please ask – would you be willing to share the game that you played for a few evenings which helped train your children to respond out of habit with “yes Daddy” and “yes Mommy”? Hi Katrina, we just tell them we were going to play a game, and then we take turns asking them to do silly things, like “Virginia, please touch your nose” or “Ruby, please run to your bedroom and come back.” The one rule is that they have to say “yes Daddy” or “yes Mommy” first, depending on who is talking to them, and then do the action. Our kids love it, and it’s been more effective than trying to remind them to say it when needed throughout the day. It’s really helped them learn to connect everything: hearing us, responding, and then doing it without delay. 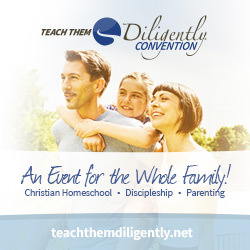 Keep up the good work, there is a generation who needs Godly wisdom for parenting. Seriously? That prayer is so controlling and patronizing? How about telling your son, “Son, I disobey to, I also need God’s forgiveness, God has placed me in your life to be responsible for you and to train you. We both have a sin issue son, but God has provided a solution for us both.” Don’t act like you sin, obedience of externals does not penetrate the heart, its just apple nailing. Its not real fruit. A 2 year old accepting a spanking calmly? LOL! Do you have kids or drones? Also, how about teaching them to apologize the correct way, you have to say “I was wrong for —— will you forgive me.” If you just say your sorry, that means nothing. Brandon, we definitely want to keep in mind our own sinfulness and need for forgiveness — and we can talk about this as soon as our children can grasp it. I’m not sure a two-year-old would understand the concept, but a three or four-year-old will. By holding our children up to God’s standard of obedience, we are not apple-nailing. We are using their behavior as a window to their heart and then correcting and teaching them from a Gospel perspective. I’m not sure what you are objecting to here. I agree with you and with Angela — teaching our children to ask for forgiveness is definitely a good idea as soon as they can understand the concept. Thanks for your comments. Very well said Daniel. Your responses show Godly character and maturity. Our family is thankful for your family’s ministry.